The story of Captain John Butler has already been extensively described in Maria Butler’s family history ‘Memories of a Shoreham Seafaring Family’ but this circa 1786 sketch shows another side of his talents. 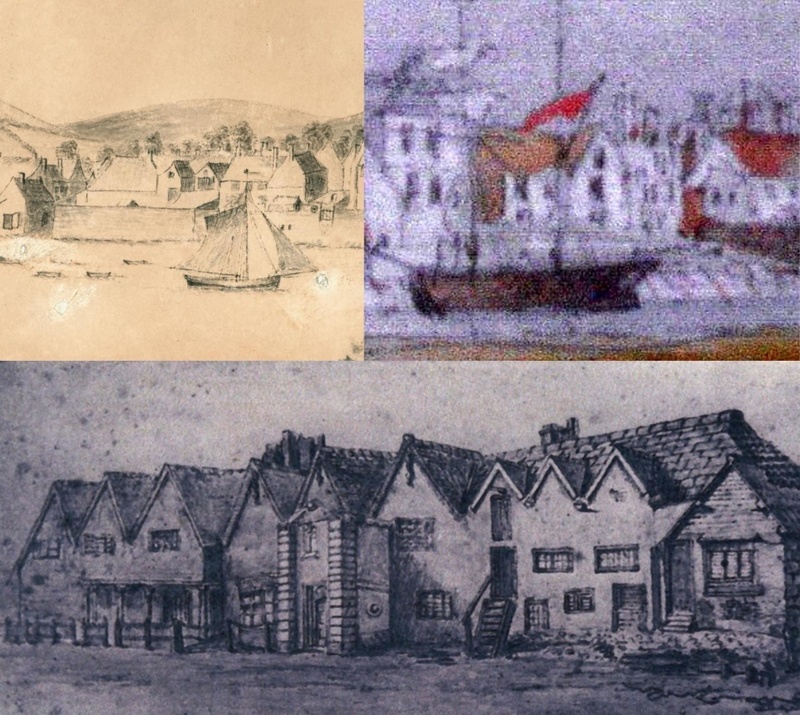 The naive character of some of the buildings, St.Mary’s church etc., in the drawing may suggest that he was not an especially gifted artist and many have thought that his representation of Shoreham is not altogether realistic. However, the placing of the various landmarks, particularly when considering for example the angle of certain places that have been identified beyond the old shipyards and hards on the riverside compared to maps of the time, indicate that he had a keen eye for accuracy and perspective – in other words if you stood on the spot where he drew his sketch you would see (barring the road and railway bridges, modern buildings etc., that now impede the view) more or less the same view that he shows in his sketch – and yes, you would also have been able to see the Old Shoreham Toll Bridge, St. Nicolas church and the windmill on Mill Hill from where he stood although smaller and more distant than he shows them. The 1782, 1789 and 1817 maps of New Shoreham do not show the south side of the river only the low tide mark. 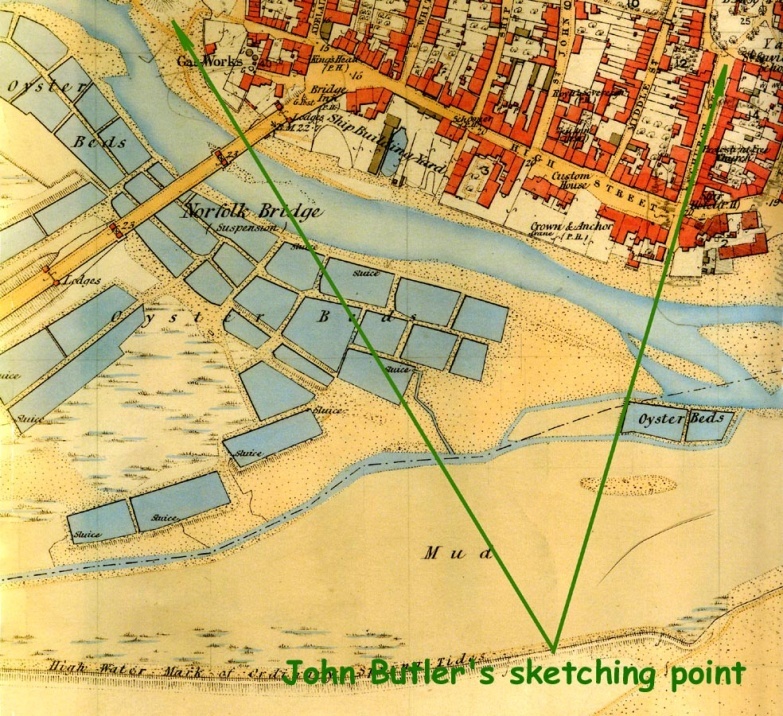 The earliest one that does accurately is the 1860 map and if a line is drawn from the top of Church Street down across the river it would meet the south bank at a point that is approximately halfway between today’s footbridge and Beach Green – Butler must have stood here in order to be able to look right up that street and the 1860 map shows a south bank edge more or less consistent with the bank as it exists now where the house boats are. A line drawn from that point north westwards back across the river shows that he would have had a clear view up to the Toll Bridge and St. Nicolas at Old Shoreham. The old Poole mansion (11) shows a marked similarity to the picture of it in Cattermole’s 1831 painting. Additionally, photographs of other old buildings that survived into the 19th and 20th centuries also display a close resemblance and positioning to those in Butler’s sketch – the comparatively extra detail shown on the old Roberts granary suggests that this also was a fair representation of that building. The positioning of the buildings on what is now Coronation Green also appears largely accurate with perhaps marginal exceptions when compared with contemporary maps. His drawings of ships, particularly the vessels’ form and rigging reflect, as a sea captain, his obvious maritime knowledge. 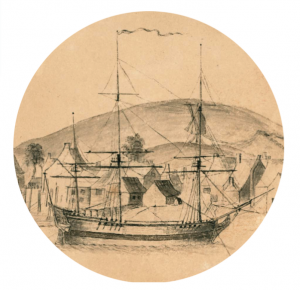 One of John Butler’s ship sketches – this one moored in front of the shipyard between Ship Street and John Street hards. 1 Old Shoreham: At the time of this sketch the Toll Bridge was new and had only been built a few years. This and St. Nicolas church appear in the drawing larger than they would have been to the naked eye as Butler almost certainly used his telescope to view them (see also 9 below). 2 Ropetackle Granary: Daniel Roberts was one of the well-known Shoreham family related to Henry Roberts who sailed with Captain Cook. He (Daniel) built it on land where a windmill had previously stood. The granary appears on the 1789 and 1817 maps but not on the one for 1782 so fits in with the estimated 1786 year of the sketch. It was a huge building with a total of sixteen large corn rooms on two floors and a massive loft on the third. It also had a counting house and a wooden pier in front used for loading/offloading grain. The granary was totally burnt down shortly after 1817 and a conflagration of that magnitude must have been an awesome sight. 3 Quay: The point where the 1833 suspension bridge was later built across to the southern (Lancing) side of the river and the north end of the road bridge is now. Between the quay and the granaries was a small shipyard. 4 Shipyard : An ancient shipyard then owned by Henry Innott that included Napper Daniel‘s blacksmiths shop – a ship under construction is just visible in the sketch (see 5). Later used by the Tillstone family (who also made rope and sails in West Street) and subsequently J.B.Balley, one of the last Victorian ship builders in Shoreham who also built Swiss Gardens. The modern day Bridge Inn now covers most of this site. 5 King’s Head/West End of the High Street: This cluster of houses (left) is a particularly good example of Butler’s accuracy. Compare his sketch with the 1789 map and the 1920’s photo (right) of the western, Ropetackle end of the High Street. Beyond the 1780’s cottages in the foreground is the King’s Head itself (shown in the photo as it looked after the addition of the gables in the 1890’s) and beyond it the building that by the time of the photo had became the West End Stores. The King’s Head was medieval in origin but this still did not prevent it from being demolished in the 1990’s. Behind it were a number of houses including a row of six dwellings owned by John Butler that were later known as Norfolk Cottages. 6. 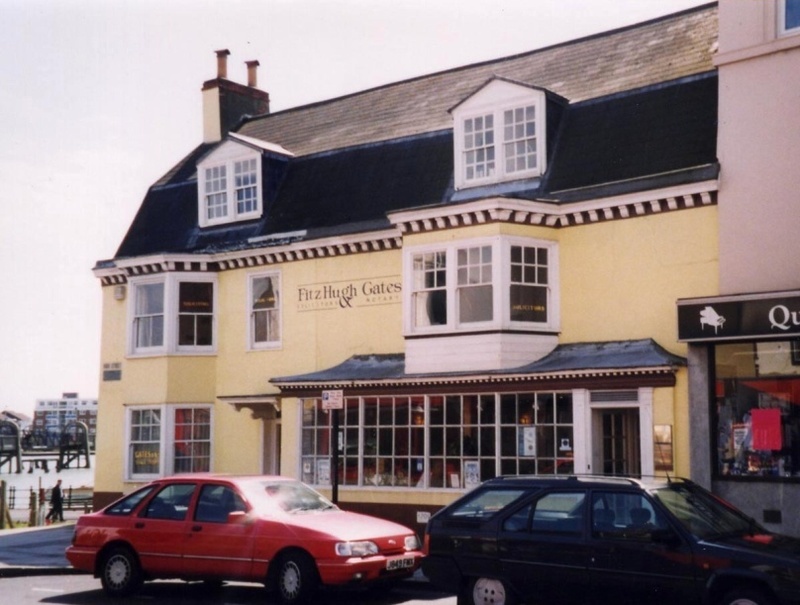 Fountain Inn: With the Fountain Inn was an adjoining assembly room then used by the local ’Lodge of Harmony’ Freemasons Society and later by travelling companies of actors to present their plays. By a coincidence John Butler’s son, also John, became landlord of the Fountain in the 1810’s and it was here on 16th October 1816 ‘in Edward’s room’ that William Butler’s amorous escapade with Sarah Fillaps took place. 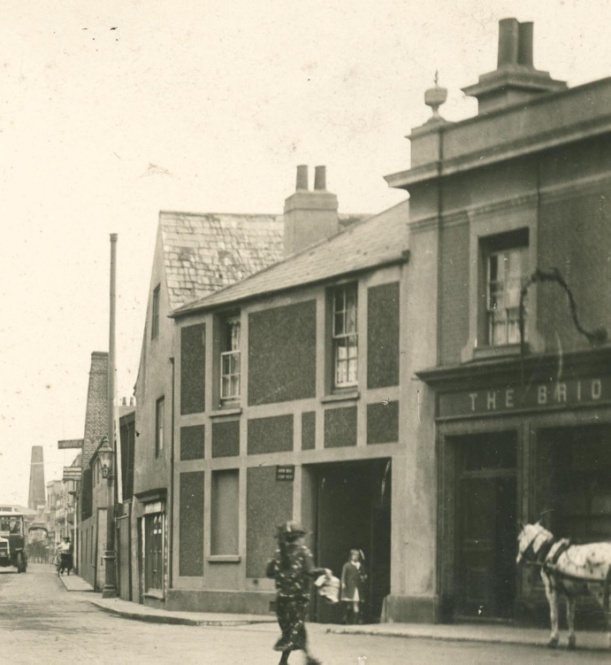 The Fountain was subsequently incorporated into the old Bridge Inn which, in turn, was demolished and replaced by the 1930’s pub nearer the bridge. This 1920’s photo shows what was left of the Fountain Inn (centre) after it had been incorporated into the old Bridge Inn. 7. Shipyard Possibly the oldest of Shoreham’s post medieval shipyards where the majority of the earliest ships were built after the harbour further up river silted up. Ships for the Royal Navy were still being built here in 1804. Look closely at the flag flown by the vessel that is docked in front of the shipyard. 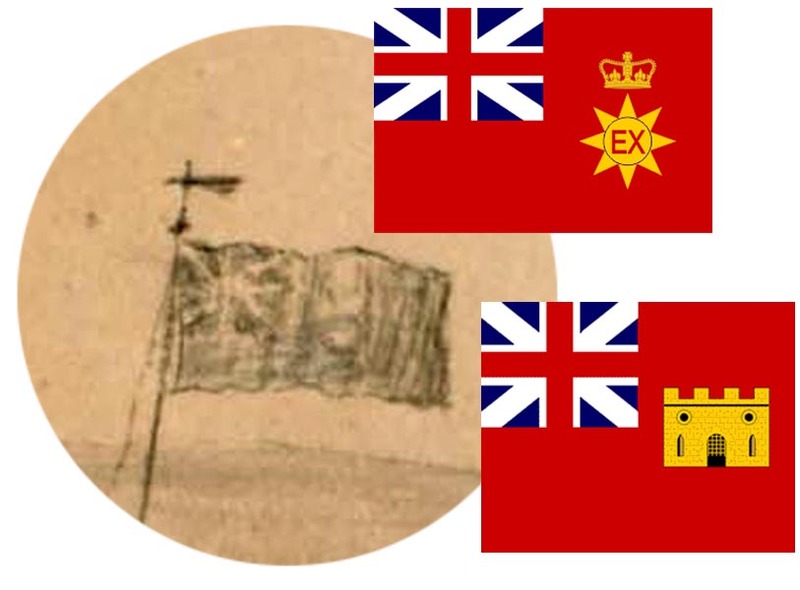 Not just a union jack, it is an ensign and, compared with the darker (red) Customs flag above the Custom’s cottages (21) is obviously white and therefore a ship of the Royal Navy. 8. Shipyard: Something of a mystery here in that the 1789 map clearly shows this as gardens whereas the 1782 Survey describes it (plot 122) as a shipyard owned by Messrs Robinson & Hanington. The later 1817 map certainly shows it as clear, unencumbered land devoid of gardens and in appearance more like a shipyard. 9. Mill Hill Windmill: Built in the 1760’s the windmill on Mill Hill was a typical Sussex Post Mill and the following picture (left) shows it as it was before it burned down in 1899. 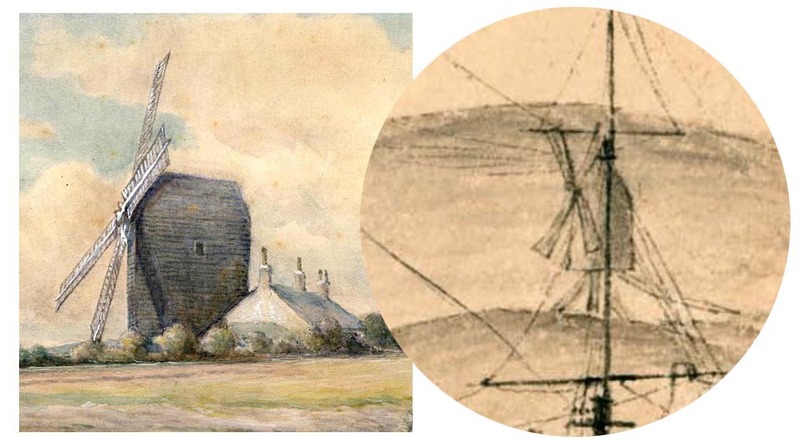 Butler’s sketch of it (right) is viewed through ship’s rigging which suggests two things:– at the time he drew the ship it was almost certainly moored on the same spot he shows otherwise he would have been unlikely to have purposely obscured the view of it ; the posts the mill rests upon are clearly shown. These could not be seen with the naked eye so, as in the case of the Toll Bridge/St. 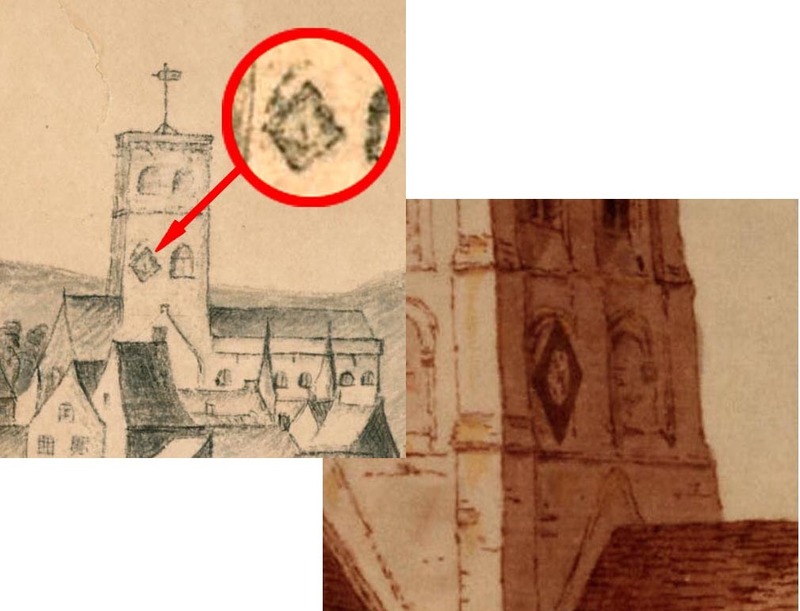 Nicolas church area, Butler also used his telescope to draw this as the rounded enlargement of his sketch suggests. The posts at the base of the mill were later surrounded by a circular wall. 10. Royal George Hotel: The Royal George was noted around this time by visiting judiciary as being ‘a den of smugglers.’ The photo shows the attractively fronted building shortly before it was demolished in the 1930’s. 11. Poole Mansion House: The Poole family’s medieval mansion house which included a coach house and attached tenements later passed to the Fawlers and Hoopers. It was demolished by the latter when the new Customs House (which subsequently became the Town Hall) was built in its place. The detail from Cattermole’s water colour (viewed from the south-west) of 1831 (top right) shows a marked similarity to John Butler’s version of it (top left) – below shows the front of the building on the High Street side. 12. 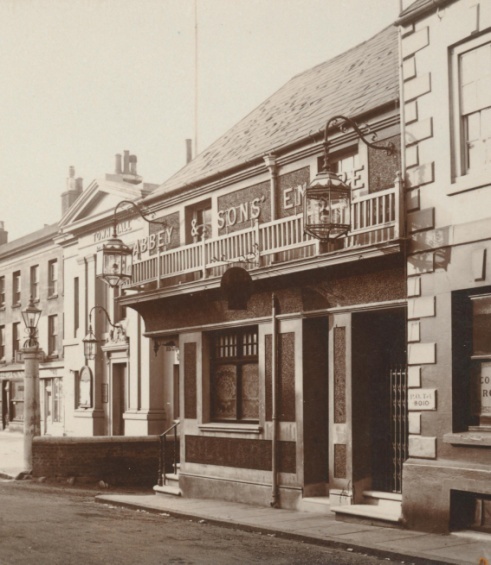 Crown & Anchor: Known then as ‘Amplefords’ this 19th century photo of the ancient Crown and Anchor building shows it looking nearer to how John Butler would have known it before the changes to it in later years. 13. The ‘Hound,’ Customs Cutter: The vessel moored at the bottom of Church Street is thought to be of the cutter ‘Hound’ in which John Butler himself sailed. It is shown here with a contemporary painting of the same class of cutter used by the Customs around the UK coast during the late 18th and early 19th centuries – they varied but were typically armed with 12 to 14 guns and manned by a crew of around a dozen men – at least one of these was built in Shoreham. 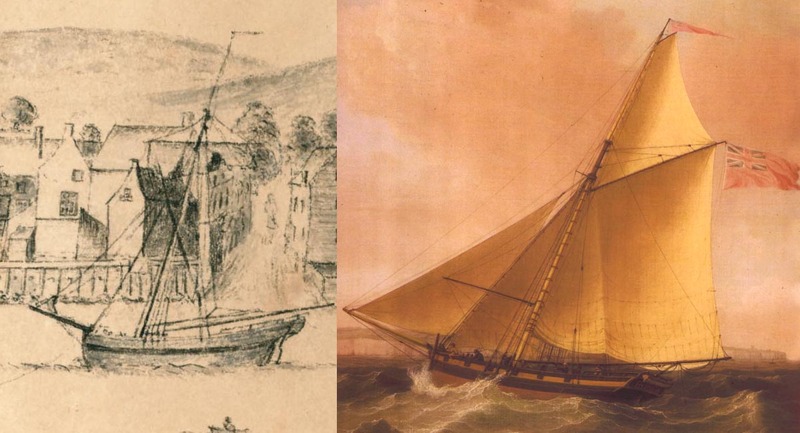 This vessel patrolled the whole of the south-east coast on anti-smuggling duties and at the time of the sketch, about 1786, the Hound was commanded by Captain Amos who lived in East Street. Amos was succeeded as captain of the Hound by John Roberts Hawkins, John Butler’s brother-in-law, at which time Butler was promoted from Customs Riding Officer patrolling the Rottingdean area to be mate of the Hound. Butler was eventually appointed as captain in 1809. 14. Stone House: This is now a solicitors office (photo) but was then ‘two tenements and a back wharf ’ when it was owned by John Robert Hawkins, another sea captain and a subsequent master of the ‘Hound’ after Amos and before John Butler. The vessel was moored at Star Gap because it was the nearest point on the river to the Customs House in Church Street (the Customs did not move to the High Street until 1830). 15. Church Street: Butler carefully positioned himself for the drawing so that he could see up into Church Street (see 17) where he lived. 16. John Butler’s House: The Church Street part of his sketch (see 17) shows that although he couldn’t see the front of his house he did at least manage to record the southern end chimney peeking above the roof tops which still looks the same as shown in this modern day photo (his house is the one beneath the church tower). 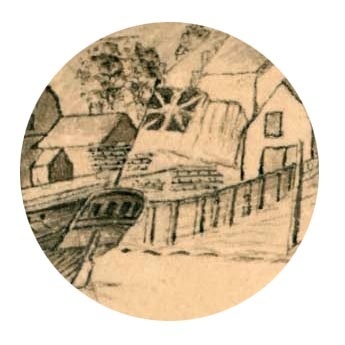 Wharf Buildings: Unlike other buildings in the sketch Butler’s drawing of this twin roofed building on the east side of Star Gap has horizontal lines drawn across its southern face. Perhaps this was an indication of timber cladding in which case all of it may have been timber built but it looks very similar to an 1878 photo of buildings on the same spot that now has sloping roof ends to the gables and the brewery chimney in front of it. 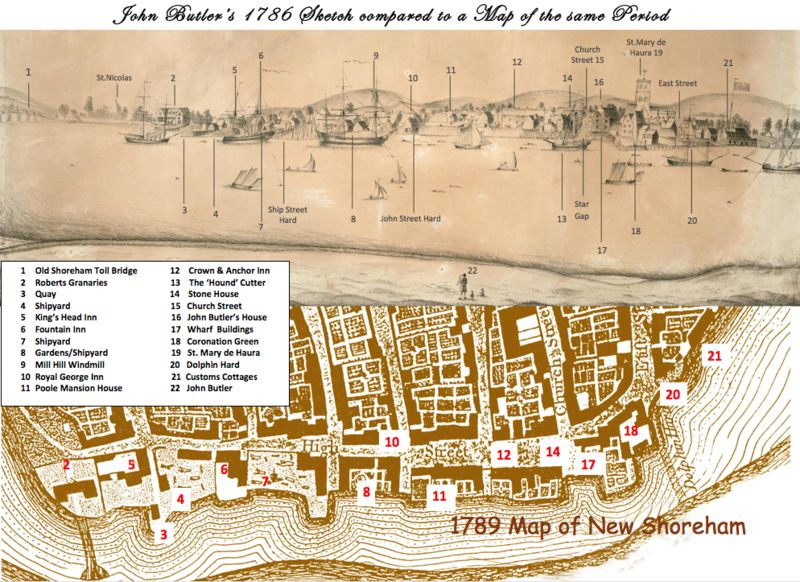 The 1789 map only shows buildings in silhouette form without any indication of individual properties within a group but the 1782 map shows three properties (A on the map) two making up the dual roofed wharf and the third the building next to it. The 1872 map confirms they had been extended towards the river but the original three buildings on the northern end of it are still clearly indicated. 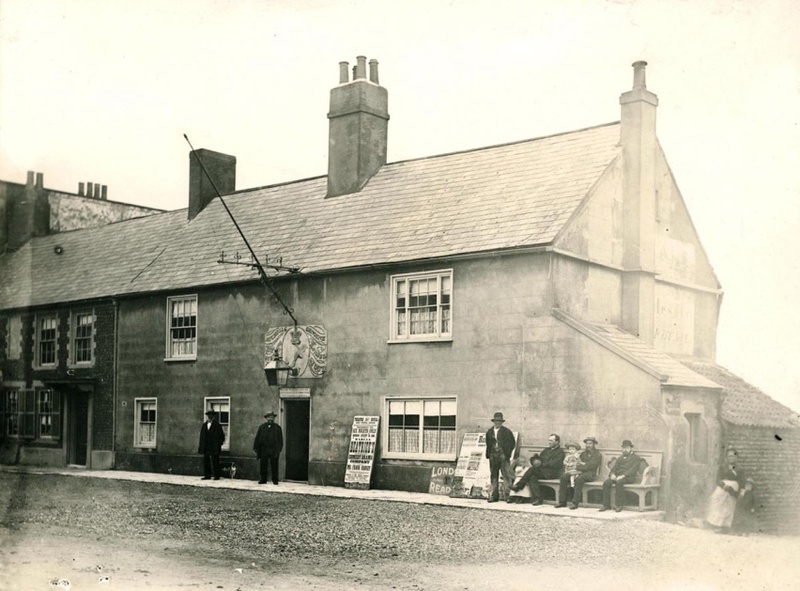 These were still standing until the 1930’s when they were demolished along with the rest of the buildings up to and including the Dolphin Inn. Hidden behind the buildings was the old Star Inn. 17. Coronation Green: This part of the riverside was then known as ‘Legal Quay.’ In addition to the Dolphin Inn the cluster of buildings here had cellars or vaults for storage and included a warehouse and brew house. There were also coal pens called ‘Close Walls’ into which the wooden colliers offloaded their cargo and ‘High Cage,’ a brazier on a boom used to guide ships into dock in bad visibility or at night. The land in front of the dual-roofed building ‘A’ was later filled in to extend that part of Coronation Green right up to Star Gap. 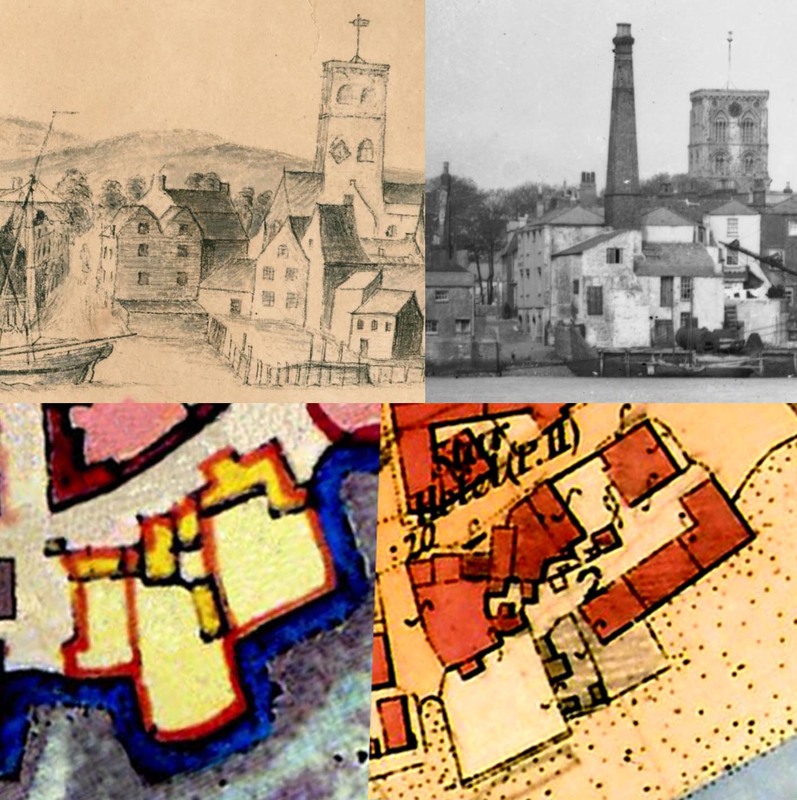 Compare Butler’s apparently randomly drawn buildings here (outlined in yellow) with the map and it can be seen that from where he was standing his representation of them, particularly their positioning, looks to be fairly realistic although there does appear to be some discrepancy – ‘C’ was the original Dolphin Inn but this was later rebuilt and enlarged as the later map in 17 shows. 18. St. Mary’s Church: As in all riverside views facing north from this point St. Mary’s church tower is always a prominent feature but the sketch reveals something more. Looking closely at the lower, left belfry ‘window’ there is a square positioned diagonally on one of its corners with the vague shape of a clock hand pointing downwards, a record of an earlier clock face that was used at that time. The later round-faced clock above the top two belfry windows was originally donated by the Hooper family in the 19th century and there is no church record of an earlier one but 18th century paintings of the church clearly show it. 19. Dolphin Hard and East Street: The area known as Dolphin Hard still exists between the foot bridge and the Sussex Yacht Club buildings but nowadays defies use as a hard for any decent sized boat with its tight, right-angled approach to the river. In the 18th (and 19th) century it was also the ford crossing point at low tide. Behind it can be seen the buildings on the south-east corner of East Street that later included the East Street Arms. 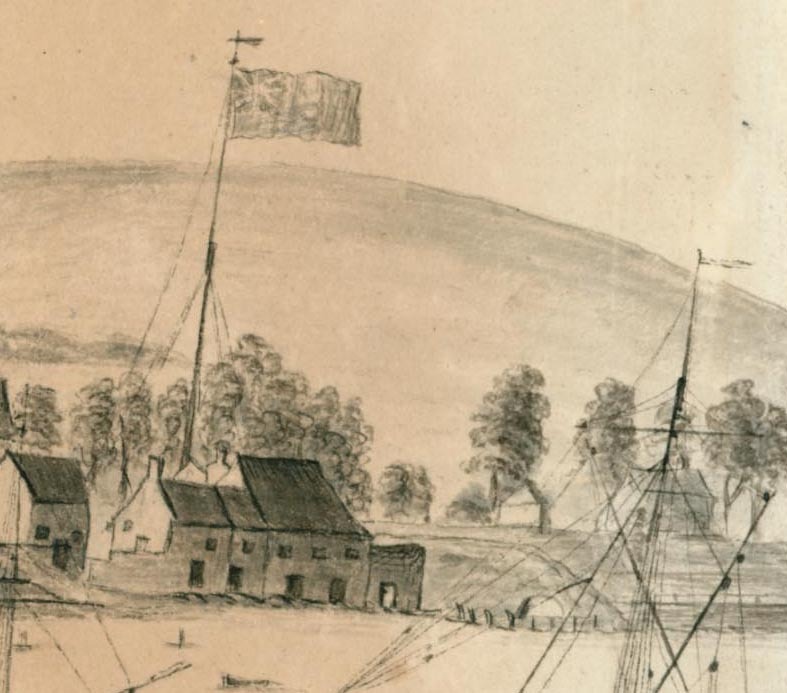 John’s drawing of the large Customs flag flying above appears to be a bit out of scale with the buildings below it – perhaps further evidence of his use of the telescope or as a customs man himself maybe he wanted to emphasise the banner. Beyond them in the distance can be seen Messrs. W & F Dean’s slaughterhouse in the Kings Arms Fields on the Ham. For John to draw detail on flags that are constantly moving in the breeze would have been difficult but he did have the advantage of knowing what that detail was so probably made the effort to show some realism. Nevertheless, the detail is still unclear and there are at least two known possibilities shown here. 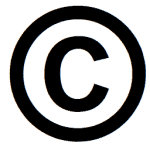 Although John’s flag arguably looks more like the top example it is impossible to be sure. 21. 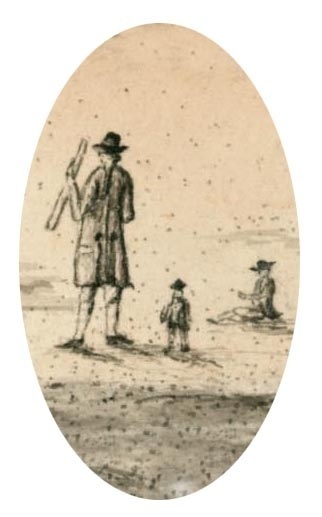 John Butler: ….. and finally, a rather human touch showing John Butler’s inclusion of himself in the sketch, holding a telescope, and two of his children. The 1872 map is the copyright of West Sussex Records Office and the 1782 detail of the old clock on St.Mary’s church tower is included by permission of the British Library (MS 5673.Item f.43 No.76). All other photos and images are from the author’s own collection and the Marlipins Museum, the latter of which are copyright protected and included with this research by permission of the Sussex Archaeological Society. If you require copies of any of their images please contact lamo@sussexpast.co.uk.